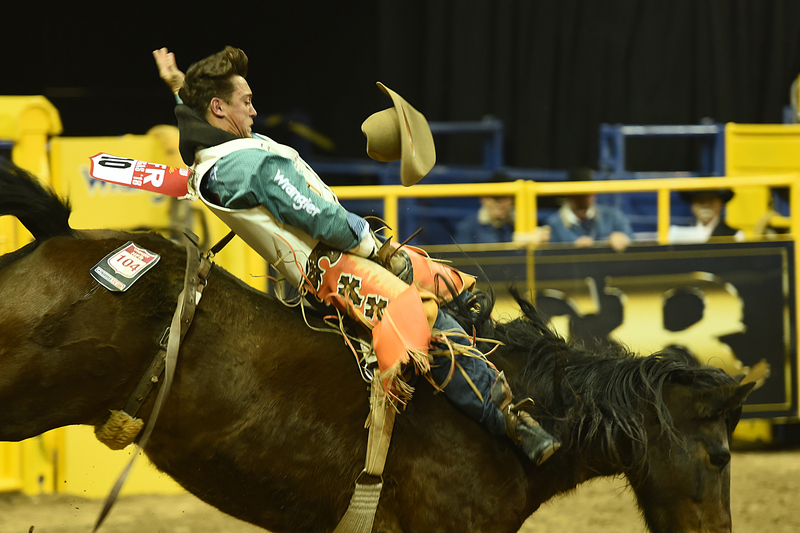 LAS VEGAS – After starting the 2017 Wrangler National Finals Rodeo slowly, Clayton Biglow made a big change to kick off the 2018 championship. On Thursday, Biglow rode Beutler & Son Rodeo’s Molly Brown for 74 points to finish in a tie for fifth place on opening night of ProRodeo’s grand finale, pocketing $5,500 in the process. “I feel like that horse got a little weak at the end, but it felt good,” said Biglow, 22, of Clements, Calif. “I got a little weak at the end, too, so there’s always room for improvement. That’s what happened 12 months ago, but he’s already surpassed that start. He’ll have another chance during Friday’s second round, when he will be matched with Frontier Rodeo’s Tip Off, a horse Biglow has ridden before. “I got on her at Dodge City (Kan.) during the short round, and it was a really good horse,” he said. “I’m super excited for tomorrow. That’s important. In rodeo, dollars equal points, and the contestants in each event who finish the season with the most money will be crowned world champions. While he remains third in the world standings, he did edge closer to the leader, two-time reigning world champion Tim O’Connell. Biglow knows he needs to keep adding pressure to the top man in the game by catching as many checks as possible. He has nine more nights in the 2018 ProRodeo season to do it.